This past week was Reggie’s birthday; it fell on Thanksgiving actually and he is six years old now. This got me to thinking about age and aging and the progression of life for our furry companions, and particularly mine. So please forgive me for being indulgent for a moment, I would like to tell Reggie’s story. We decided that we wanted a black lab-ish dog and started looking at the local rescues lists of available dogs. We found two black labs that we chose to go see, both happened to be from the same shelter. By some weird coincidence they were both named Charlie. One of the Charlie’s was just under a year old and looked to be a solid lab- no papers, but physically looked labrador all the way. And had the puppy attitude to match. The other Charlie was just over a year old, an obvious cross, and was calm but inquisitive. We ultimately chose that one. On the car ride home we started calling him Reggie (it just fit- he was Reggie, not Charlie). I’ve written already about the ensuing weeks and the immediate realization of his health problems (allergies– food and environmental), but there was also an immediate realization of just what a gem of a dog we rescued and what his fate would have been had we not. And that was only the beginning- about a year and a half later was when Reggie had his first seizure and we learned he also had epilepsy. 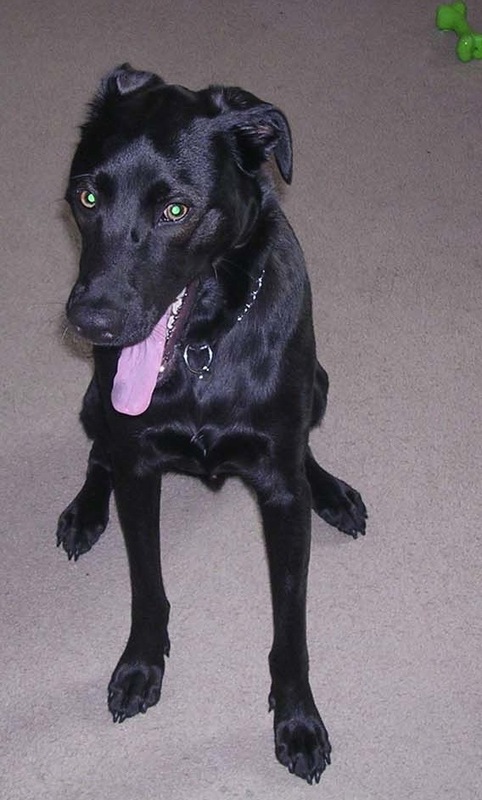 Reggie is attentive, responsive to training, affectionate, and has generally obeyed corrections on the first go. When I reflect on others pets, I marvel at just how remarkable he is. We spend the time and effort training him, yes, but I see how much time and effort others put in to their animals and I feel lucky to have this dog as mine. That being said, he is now six. This past year I have noticed some changes in him. He is starting to gray around his muzzle and when he plays really hard at the park or has an active day he has trouble getting in and out of the car. He takes glucosamine daily due to a previous ACL injury and still has the playful attitude and desire he did the day he came home. So what is aging for dogs? How would I know what to change in his routine, if anything? I always remember that calculation that one human year equals seven dog years (so Reggie is 42…). 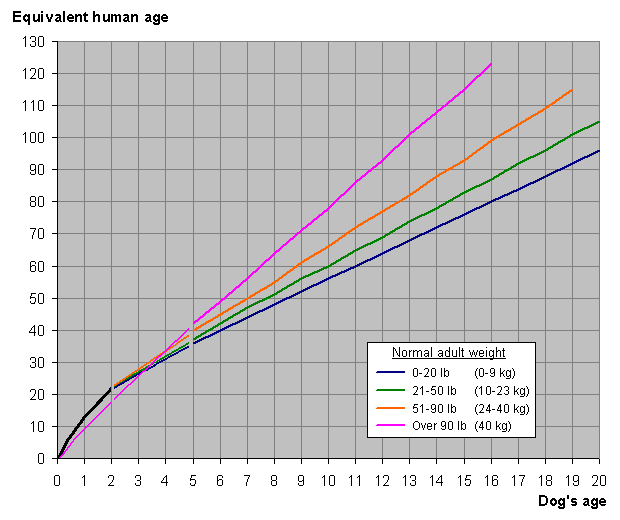 This chart more accurately represents current belief for dog vs. human age. According to this, Reggie is 45-47 years. The idea is that dogs reach sexual maturity in the first year, so 10-15 human years. In the dog’s second year, it is about 3-8 human years in terms of physical and mental maturity. After that, each year can be about 10 human years depending on breed. Of course life expectancy varies by breed, and therefore aging and geriatrics varies by breed. A Great Dane can be experiencing health problems attributed to age at seven, whereas a chihuahua might not experience the same issues until the age of 12. Generally, the first markers are graying around the muzzle and face, reduced hearing, muscle weakness or loss, and slowing down- sleeping more, playing less or for less time. These things probably won’t happen all at once or all things at once, but when they do it is a sign to talk to your vet about a senior program. Senior dogs require less calories and are at higher risk for obesity, are more sensitive to temperature changes, and even can develop cognitive dysfunction- the canine version of Alzheimer’s. Refer to this list for more changes that occur in senior dogs. Reggie is not there yet- he is only displaying a couple of the first markers. But it is definitely a conversation I will have with the vet at his yearly checkup. 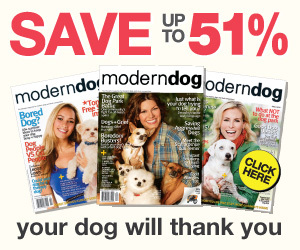 How have you handled your dog’s senior care?